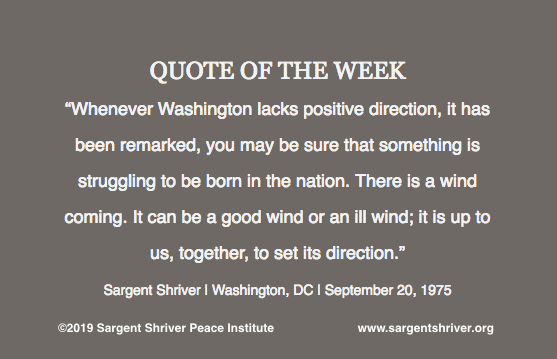 Sargent Shriver Peace Institute - "There is a Wind Coming"
In our Quote of the Week, Sargent Shriver describes what he sees as an inflection point in the history of the country. His observation that we, the people, can shape the events during such an inflection point, is what we’d like to focus on this week. Whatever your opinion about the current moment in our collective history, it is difficult to deny that we too currently lack momentum. Our withdrawal from several international agreements, and our recent government shutdown at home, are signs of lack of engagement and forward motion. It is up to us to embrace the values that will allow us to participate in the world as global citizens, and to strengthen our own population. Sargent Shriver believed that those values included a willingness to collaborate with other nations, and an emphasis on justice, equity, and opportunity for all human beings everywhere. We can all exercise these values in our everyday actions at home and in our communities. And we can also exercise them when we choose our leaders – or by deciding to lead ourselves!